Calculates Sun, Moon, Mercury, Venus, Mars, Jupiter, Saturn, Uranus, Neptune, Pluto, Node, Pars, Chiron, Lillith. Calculates Radix, Transit, Solar, Lunar, various returns, Progressions, Composites, Harmonics, Heliocentric, Dwad. Automatic timezone atlas for the whole world with 355.000 places. Switch or swipe between various screens like wheel, aspecttable, data, rulers, midpoints etc. Support for resolutions of 800x480 and above. Works for tablets and phones. Different display for portrait / landscape. Eleven housesystems: Placidus, Koch, Campanus, Regiomontanus, Equal, Vehlow, Porphyrius, Whole Sign, Axial Rotation, Azimuthal, Polich, Alcabitus, Morinus, Krusinski-Pisa. Daily ephemeris for all planets, go forward/backward per month or year. Live transits, shows a transit which is continually updated with current time. Time menu with extensive transit hit lists (Diary) and transit graphs, declination graph. Several screens with all kinds of data like latitude / speed of planets, true asc / mc and housecups, aspects, midpointtrees, asteroids, uranian bodies, dignities, planetpatterns, planet nodes etc. Plutoids Huya, Makemake, Haumea, Eris, Ixion, Quaoar, Sedna, Varuna, Vertex, Pars fortunae, Corrected Lillith (Carteret), Pholus, Ceres, Pallas, Juno, Vesta, Cupido, Hades, Zeus, Kronos, Apollon, Admetos, Vulkanus, Poseidon, Planetary hour. Progression types: Secondary, Primary (W.v.Dam) Solar Arc, Quotidian, User Arc, Converse. Synastry : Radix / Transit, Radix 1 / Radix 2, Radix / Live Transit, Radix / Transit, Radix / Solar, Radix / Solar, Radix / Progression, Radix / Harmonic., etc etc. Fixed stars, Rulers and dispositors, Midpoint tree, Parallax, Dignities, Aspect patterns, Arabics. Database manager for horoscopes, Delete or Edit Horoscope, Create other databases, Copy horoscopes between databases. Import from Quick Chart or Planetdance for windows. Option for wheel layout, change layout for single horoscopes or synastry. Languages currently available: Arabic, German, French, Dutch, (Polish, Spanish, Russian uncomplete). - Basics The app has several slots for horoscopes. You can have two radices, a transit, and derivatives like progression, harmonic etc in memory. These will be reloaded on the next startup. You can calculate horoscopes by using the New menu, or load them from disk by Open, you can view the slots in memory by using View or by swiping. Entries in the View menu may be greyed out if they are not yet calculated. In the Synastry menu entries may also be greyed out if the necessary data is not yet available. 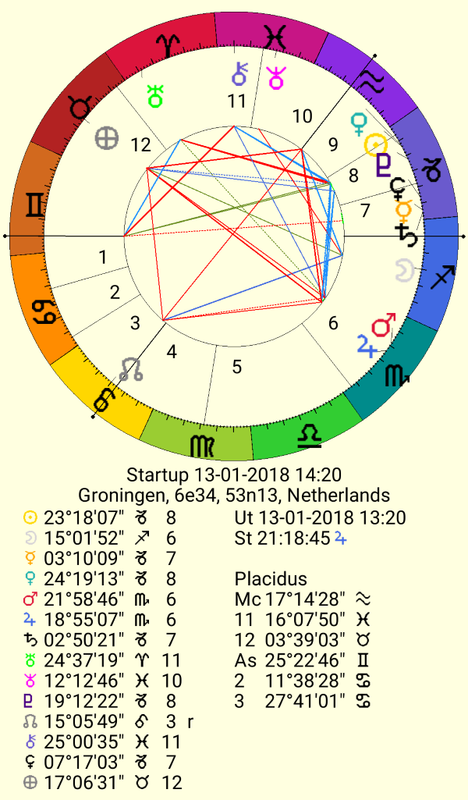 Horoscopes you calculate like a progression or a harmonic etc are not automatically recalculated if you load or calculate another radix, those slots will remain to have the progression etc you calculated earlier for the other person, calculate them again for the new radix if you want to see that. - Swiping You can swipe left / right to see the various pages with info about the current horoscope like Aspects, Data etc. There is no preview, you swipe and you see the other page instantly as soon as you lift your finger. In Options Two you can set behavior for swiping, you can adjust the minimum distance your finger has to travel so you can adjust sensitivity and you can set it to wrap around at the edges. You can also swipe up/down to switch between the various horoscope slots in memory, or even the list with recent horoscopes, see Options Two. - Older databases Since version 3 there is a change in how horoscopes are stored with regards to information about country / place / timezone. Because planetdance stores it's horoscopes calculated, you will only notice the change if you edit a horoscope. It could be a place is not immediately found in the new databases, or has a slightly different name (for instance places can have umlauts and other accents now). - On some devices, if you don't close the app and open other apps, this app might show a black screen when you start it again. Just close it with the backbutton and start it again. Best is either to close the app when done or use androids taskmanager to switch back to it. - On some devices there is no "Please Wait" message. - Arabic font on lollipop is invisible. - Startup At start a transit is calculated for current date/time and the default place. See Options - default place. You can set what you want to program to show at startup, see Options One. Radix 1 opens the dialog for entering a new horoscope. Date and time: with the numerical keyboard you can use .- or space to separate the numbers, examples: '1-1-1900' or '1/1/1900' or '1 1 1900'. Using the standard keyboard you can use whatever to separate them. Pressing Done on the keyboard advances to the next edit field. Use the buttons to quickly change day/month/year/hour/minute. If you press Ok you are asked if you want to save the horoscope (you can disable this question in Options Three). The horoscope is saved in the current active database, see 'Open' for more information on databases. For places, first choose a country, then select from one of it's places. You can choose between 11 housesystems. You can choose if you want to calculate gmt from the timezone or use gmt directly. You can see the resulting UT as you change date/time and the labels in front of the editboxes for Gmt and Dst will display the difference in minutes that setting makes. Radix 2 same but for a second radix. Secondary Houses are calculated from the progressed Armc. Solar Arc All planets and housecusps are moved over the same distance as the progressed sun. Quotidian Houses are calculated from the progressed time just as the planets. User Arc You can enter an arbitrary arc to move the planets. Converse Secondary A converse progression goes backwards in time. Converse Quotidian Same for quotidian. Primary Primary progression method W. van Dam. Return Calculates Solar, Lunar and returns from Mercury - Saturn. For a solar only the year you enter is processed. For all other returns, it calculates the next one after the date you enter. Harmonic Calculates a Harmonic, you are asked for the number. Heliocentric Calculates a Heliocentric horoscope. Sidereal Calculates a Sidereal horoscope, use this if you want to quickly see a sidereal without setting it as the default. View Here you select what horoscope(s) you want to see. If there are entries grayed out, you first have to calculate or load these. For instance, to see a Solar in this menu, you first have to calculate one. Transit View the Transit. Any transit also displays the planet for the planetary hour after the Sidereal Time. Radix 2 View Radix 2. Live Transit this is a transit that is continually updated for the current time. Progression Shows the sec. Progression / Solar arc / Quotidian. Wheel This shows the wheel together with columns for planets and houses. Aspects This shows the aspect table, a list with aspects (which can be sorted using the Sort button) and a graph for elements / crosses with percentages in both sign and house. Data Shows a screen with info like latitude / speed of planets, true asc / mc and housecusps, asteroids and plutoids for the current horoscope. It also displays Cor(rected) Lillith (Jean Carteret / George Bode). Rulers Shows a graph with the rulers for signs and houses and the dispositors. Midpoints Shows a midpoint tree. You can set the orb for the midpoints in Options - Orbs. Decl. Nodes / Uranian Shows a page with various info; declinations, nodes from ascending / descending mercury - pluto, and some uranian bodies. Patterns / Dignities Shows a page with planet patterns and dignities. Fixed Stars Displays the conjunctions with 359 fixed stars. Arabics Displays some arabic Lots. R1 is the value for Pars Fortunae, R2 the value for Spirit. Greek This draws a horoscope with Whole Sign houses and without outer planets as used in Hellenistic astrology. Planets aspect each other by sign. Edit Lets you edit the current horoscope. When you edit a horoscope the name is readonly. If you want to change the name too, use Open - Edit. Notes This is a very simple texteditor for the current horoscope. The notes are saved in [sdcard]/planetdance/notes in UTF-8 encoding. The name for a note consists of the name of the person and the name of the database. If you click Info some basic info about the horoscope is inserted. Sort Sorts this file to name, date or longitude of any of the planets. All databases will be sorted this way. Other File Select another database. New File You enter a filename and it will be created. Delete File Deletes that database. You can't delete the current database. The operation can't be undone. Name to Radix 1, Radix 2, Transit Loads the current horoscope as Radix 1 or Radix 2 or Transit. Edit name Edits that horoscope. Copy name Copies that horoscope to another file. Delete name Deletes that horoscope from the database. The operation can't be undone. Move name Moves that record to another database. Copy / Delete / Move selected If you have made a selection you can process those horoscopes in one go. Invert selection Makes wonderful coffee, hardware dependant, does not work on every device. Close Closes the dialog just like the button. Recent Here you can re-open horoscopes you have saved or opened before. It also displays a panel with info on the currently loaded horoscopes. Just as in Open there are two buttons to quickly reload a horoscope into a slot, and there is a button to remove a horoscope from the recent list. This does not remove a horoscope from disk, only from the recently loaded list. Synastry This contains serveral composite types as well as biwheels. In a biwheel, lines for aspects to the outer horoscope are drawn to the edge and lines to the inner horoscope are drawn to a radius a bit more to the middle. (You can change all that in Options Layout). Midpoints A midpoint horoscope between Radix 1 and Radix 2, houses are calculated from their midpoints too. Armc Placidus houses are calculated from the midpoint of the Armc's and the average of the ecliptica's for the current place of the relations. Combine A chart calculated for the 'midpoint' in time and place. Radix 1 / Transit a synastry horoscope between the current Transit and Radix 1. Note that the housepositions displayed in the columns for a synastry are for that planet in the other horoscope's house. Radix 1 / 2 a synastry horoscope between the two radices. Radix 1 / Live Transit a synastry horoscope between the Live Transit and Radix 1. Radix 1 / Progression a synastry horoscope between Radix 1 and the Progression. Radix 1 / Solar a synastry horoscope between Radix 1 and the Solar. Radix 1 / Lunar a synastry horoscope between Radix 1 and the Lunar. Radix 1 / Harmonic a synastry horoscope between Radix 1 and the Harmonic. Radix 1 / Heliocentric a synastry horoscope between Radix 1 and the Heliocentric. Radix 1 / Sidereal a synastry horoscope between Radix 1 and the Sidereal. Radix 1 / Dwad a synastry horoscope between Radix 1 and the Dwad. Switch Radix 1 - 2 Switches both radices so you can work with the other one. If you click on Options you can set which planets / aspects, the type of the graph (transit only or transit / radix) and other settings. Use Load to quickly load a file with settings. You can swipe left / right to go forward / backwards in time. Each time you close the graph, current settings are saved for the next time. You can also swipe down for the menu and swipe up to close the graph. <- Previous and Next -> Goes back and forward in time. You can also swipe left / right. Transit / Radix / Aspects Use these columns with checkboxes to set the planets / aspects involved. Type Transit or Transit / Person, switch between transit and radix/transit. Years / Days set the amount of time to display on one page (portrait). Sidereal Use this if you have some ayanamsha set as default in Options general and you want the graph to use that setting too. If you leave this unchecked the graph will not be calculated sidereal even if you have some ayanamsha as default. Stored Time If this is checked the graph will start at the time you define in Start (see below). Else the graph will start at the current time. The first is mostly used if you are interested in some fixed time period, like for instance the uranus-pluto square from 2003 - 2011. The latter is mosty used with some radix to quickly see what's ahead. Orb You can set which orbfile you want to use for the graph. A few orb files are distributed, for instance one.orb makes all orbs 1 degree. Start Sets the time and place to start the graph. Save you can save the current settings with another name, so you can have various settings. Load load previously saved settings. There are some example files distributed you can load. Ephemeris Displays an ephemeris, you can go a month or a year backwards or forward. Use Start to set another start date. Diary This presents in a scrollable list events from planets, direct / retro, aspects going in and out of orb or becoming exact. It uses the same options dialog as Transit Graph. Note that times reported for the moon's node are sometimes a bit off. Copy This draws a horoscope, single or biwheel, from the current event. First select an event, then click Copy. Graph This displays a graph for the found events. The graph has a menu where you can sort it's output or make a screenshot. Load This quickly loads one of the settings. On top of the graph are the six dates the time period is divided into. The date at the bottom is the date of the end of the graph. The graph displays the day of the date when an aspect becomes exact below each bar. If there is no date present it may be because he aspect is not exact during the time period. If there's no bar it's because the aspect coming into orb is the last event in the graph. Options This is exactly the same as with Transit Graph, except there is also a checkbox to set if you want retro/direct information in the listing. Declination Graph Displays a graph with secondary declinations for a person for a period of 100 years. Clear Slots This clears all slots like progression, harmonic etc except radix 1 / 2 and the transit. This is useful if you have swipe up/down enabled and you want to start with a fresh list. Import Quick Chart First copy your qck file to the planetdance map on your sdcard. You can edit each record to check the data, place etc. (you can also disable this in Options 3, 'Ask Import'. A database will be made with the same name as that file. Because of differences between each software's database with countries and places importing these will not be perfect. So if you edit a horoscope you imported, take care to set the right country and place. The imported names can have unicode UTF8 format. Note however some programs like Zet export Cyrrilic characters to a file with CP1251 which cannot be imported, use notepad++ on windows to convert such a file to UTF8 before importing. Import Planetdance Windows Copy the database to your sd card just like above but before using this function rename it to .dbw !! Don't try to open a windows .db on android, the app will probably crash. Screenshot makes a screenshot of the current drawing and saves it in the map on the sdcard (default /sdcard/planetdance/) with a name containing current date and time. Dateformat choose between dd-mm-yyyy / mm-dd-yyyy / yyyy-mm-dd. Housesystem choose the default housesystem. Startup choose which horoscopes you want to program to show at startup. Colorset choose which colorset to use. Symbols choose which symbolset to use, default, Marieke, Hans or Eelco. Graphic fontsize you can alter the fontsize used in drawings. Dialog fontsize alters the fontsize used in dialogs like Open, it also effects the fontsize in the menu. Minor asp choose if you want minor aspects drawn. An inconjunct is considered major although strictly speaking it's not. Not you can always disable aspects by setting their orb to -1. See options orbs. Parallax choose if you want parallax corrections. Night pars choose which calculation you want for Pars Fortunae. Zodiac colors choose if you want the zodiac colored or not. Numeric keyboard if on the numeric-only keyboard is used for editing date/time and other numeric values. Sidereal choose if you want sidereal calculations by default, you can set this to 'none' or to one of the 27 provided ayanamshas. Note you can have a extra button onscreen to toggle quickly between sidereal / tropical, see Options three. Show Button You can hide the menu here and use longpress to access the menu. Buttonsize You can adjust the size of the menu button. Screenshot This sets the size of the image, the position in the middle is the normal size, you can in- or decrease it..
Time correction use this on cheap devices that don't report correct time for startup, use a value in minutes. On my cheap tablet I have to use 240 because else it's 4 hours early. Edit Language This button is only visible if you have a language other than English. You get a dialog where you can set each phrase in the translation. Save will save you changes to the file so they are used permanently. Reset will restore the original phrases. New will ask for a filename, then it will create a template with extension .lan you can use to define a new language. You can edit the whole new language through this dialog, however it would probably be easier if you use a desktop to comfortably edit the file. See at the bottom of this help for some guides to translation. Storage folder Use this to set the folder for storage. After confirmation all files like horoscopes, places, settings etc are moved to the new folder. This is for people who have their external card at EXTSD or something. Use with care. Reset planetdance This will erase the files with settings, then quit the app. Upon restart all settings will be reset, you horoscopes and files you made will not be affected. Use this in seldom cases like you accidentally erased the database that comes with planetdance or something. If you really messed things up and this does not help you can also delete the planetdance map on your sdcard, then restart the program, all necessary files will be generated anew. Roman Check this if you want Roman digits for the houses. Seconds Toggles the display of seconds in the time displayed on a horoscope. Swipe sensivity This adjusts the distance you have to travel your finger to cause a swipe. Swipe wrap This toggles wrapping around when you swipe and get to an edge. Swipe repeat Normally you have to lift your finger to cause a swipe but if this is enabled you can swipe through several screens while holding your finger down. Swipe updown Enables vertical swiping through the slots in memory, note you might accidentally swipe updown sometimes so this is optional. Swipe recent Enables vertical swiping not only through the slots in memory, but also through the recent files list. 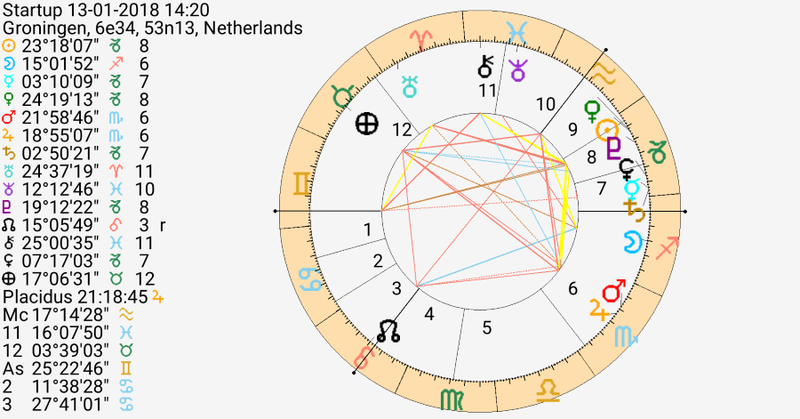 Note this can be confusing as entries from the recent list are loaded into the slot for radix 2, so this slot, as well as for instance a synastry page between radix 1 and 2 will change too. In sign Check this if you only want to see aspects that are in sign. Big symbols Uncheck this if you don't want bigger symbols in the wheel. Symbol size You can alter the size of these symbols. Clockwise Check this if you want the wheel drawn clockwise. Rev. Planet/house This reverses the radius for Planets and Houses in the wheel. Trop/Sider Button If you check this, a button will be present on each wheel page to quickly switch between sidereal and tropical calculation. If you have some ayanamsha set as default in Options One, the default for the button is Tropical, else Sidereal. The ayanamsha used for this toggle is the last ayanamsha choosen in New Sidereal (not the one set in Options One!). Note: A horoscope is saved with either tropical or sidereal longitudes, according to the setting for Sidereal in Options One at the time it was saved. If however a horoscope was saved with the opposite (sidereal - tropical) setting from the one you have now, you have to click the toggle button for this horoscope twice to see something happening because the horoscope is already displayed 'the other way'. Ask save If unchecked no question will be asked if you want to save a horoscope after you created or edit it, it will just be saved. The confirmation about the save will also be skipped. Edt on Import save If unchecked an entire database will be imported without user interference. Orbs set the orbs for a planet/aspect pair. Doubleclick a value to edit it. If you set an orb with negative value like -1, that aspect is not considered. When calculating aspects for a single horoscope, all orbs are multiplied by the factor 'Single', when calculating aspects for synastry all orbs are multiplied by the factor 'Double'. Midpoint is the orb for calculating midpoints in View - Data, Fixed stars for the conjunctions in Fixed stars. Graph Single and Double are factors for transit graph. Min % and Max % are for setting the percentages to display either a thick or a dotted aspectline in the wheel. If the actual orb is larger then Min% of the maximum orb for that planet/aspect combination, a dotted line will be dawn. If you set Min to 0 you won't see any dotted lines. Same for Max but reversed, if you set Max to 100, no thick lines will be drawn. Min must be in range 0-40 and max in range 60-100. The Reset button will revert to the original values. You can save and load orbs settings, there are a few settings distributed; for instance one.orb makes all orbs 1 degree. Edit Places Lets you edit / add / delete places. To edit a place, choose it, make changes, then press Edit. To add a place, choose a place nearby, make changes, then press Add. To delete a place, choose it, then press Delete. Note if you change a place it will not affect calculated or saved horoscopes. You have to edit these horoscopes and choose the place for them again. If you make changes to places please consider emailing them to me at jeancremers@gmail.com so I can include them. Rulers sets the rulers for the signs, this is used when calculating element/cross percentages. Planets Use sets the planets that are used in wheels and aspecttables, data, midpoints etc. Aspect sets the planets that will have aspect lines drawn in the wheel. The Time functions and databasemanager are not affected. Pages sets the pages that you can swipe to, use this if there are pages you seldom view. You can view any page through the menu regardless of this setting. Points sets the weight each planet or ruler has when calculating element/cross percentages. Doubleclick a value to edit it. Layout this is for creative people only: you can set the various radii that make up the layout of a horoscopewheel, the first 6 values are for a single horoscope, the last 11 for a synastry. Doubleclick a value to edit it. Colors choose the colors for the symbols and the background of the zodiac. When you are done you are asked for a name, so you can make your own colorset. Colorsets which are distributed with the app can be reset with the Reset button. Help Shows Help and program info. Exit This quits the program. Thanks to: Marieke, Gail, Hans, Eelco, Beatrice, Martin, David, Monadhl, Pam, Ziyad, Ed, Mavis, Hank. The other languages, Russian, Spanish and Polish are unsupported, if you want to take responsability for an translation mail me. If you want to translate there's also a file called 'empty.lan' you can use. See the other .lan files for examples. Also see the help for Options Two Edit Language, you can use that function to create a template. The template contains lines that need translation. If you create a new language please email so I can add your work to the distribution, you name will be mentioned in the credits above. Please be aware that it is very important to keep wordings very short. They have to fit into the menus / buttons. That may not be an issue for a big tablet but people with a small phone like a 400x800 display will not be able to read long texts, they will be shortened. Please try to test it on a small phone. Also note that i will want to contact you when there's an update with new / other words for the app.